Independence Hall. Photo by G. Widman for Visit Philadelphia. The bronze statue of William Penn atop Philadelphia’s City Hall surveys the city the Quaker leader founded on the principles of democracy and religious freedom. From the earliest days of American history Jews have answered that call of liberty, building a thriving community that still flourishes today. 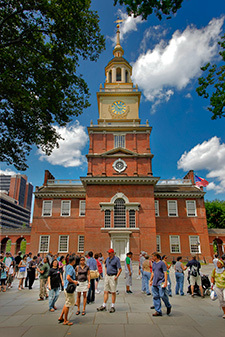 Visitors come to Philadelphia for history, art, culture and food. Sandwiched between New York and Washington, D.C., it has a character all its own, anchored by Independence Hall and the Liberty Bell, museum collections and street murals that beautify even its grittiest neighborhoods. Hidden amidst these treasures are intriguing Jewish facts: Benjamin Franklin was a top donor to Mikveh Israel, Philadelphia’s first Jewish congregation. “Hatikvah” composer Naftali Herz Imber lived on Gaskill Street in the Jewish Quarter. Frank Lloyd Wright designed his only synagogue—Beth Sholom—in Elkins Park. Sefardic Jews from New Amsterdam (New York) began trading with Native Americans in the area as early as 1655. The first permanent settler, New York-born Nathan Levy, founded a shipping and import-export business in Philadelphia in 1737 with his cousin David Franks. Their ship, Myrtilla, transported the Liberty Bell from England. Levy purchased a piece of land for use as a burial ground (the Walnut Street Theatre, between Eighth and Ninth Streets, stands on that site today). In 1740, he established a permanent cemetery at 200 Spruce Street. The small Jewish community officially founded Mikveh Israel and built its first building on Cherry Alley in 1782 (a sign marks the spot, now the site of an art gallery). 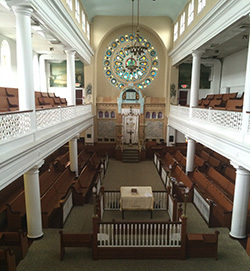 Mikveh Israel is the second-oldest congregation in the United States. At the end of the Revolutionary War, the synagogue was left with a huge mortgage, resulting in a public appeal for funds; Franklin was a major contributor. Mikveh Israel drew both Sefardic and Ashkenazic Jews. Polish-born financier Haym Salomon and German merchants Bernard and Michael Gratz were among its founders. Michael’s granddaughter Rebecca Gratz founded the first Jewish Sunday school and several social service agencies for women and children. She is said to have been the model for the heroine in Sir Walter Scott’s Ivanhoe. Salomon, members of the Gratz family and 21 veterans of the Revolution are among those buried in the cemetery. Frank Lloyd Wright’s Beth Sholom. Photo by Rahel Musleah. Rabbi Sabato Morais spearheaded the founding of the Jewish Theological Seminary in the late 19th century. Jurist and scholar Mayer Sulzberger and educator Cyrus Adler helped establish several organizations, including the American Jewish Committee, in the early 1900s. Isaac Leeser created the Jewish Publication Society, where Henrietta Szold served as its first editor (1892-1916). In 1897, Rebecca Gratz’s brother Hyman established Gratz College and, in 1907, Moses Dropsie endowed the first postgraduate institution for Jewish learning (now the Katz Center for Advanced Judaic Studies at the University of Pennsylvania). Ashkenazic Jews broke away from Mikveh Israel in 1795 and founded the German Hebrew Society, later called Rodeph Shalom. By 1850, the Jewish population neared 8,000. The German Jews lived north of Market Street. When Russian Jews arrived by the thousands fleeing the pogroms after 1881, they settled in six square blocks between Spruce and Christian Streets to Second and Eighth Streets; the Jewish Quarter bustled for 40 years with synagogues, immigrant banks, Yiddish theater and newspapers, cigar shops and textile factories. As the area became rundown, residents moved north to Strawberry Mansion and Parkside. In the 1940s and 1950s, they migrated into Northeast, from Oxford Circle to the Bucks County line, and northwest into Germantown and Wynnefield. Another migration in the 1970s spread out along the Main Line and along the Old York Road corridor to Elkins Park, Cheltenham and Jenkintown. Many have also moved south to New Jersey suburbs like Cherry Hill. The Jewish Quarter was rebranded Society Hill (originally referring to the charter for a Society of Free Traders). Philadelphia is the seventh-largest Jewish community in the United States, with a population of 250,000. The Jewish Federation of Greater Philadelphia (2100 Arch Street; 215-832-0500) runs numerous programs in the Northeast. The Kaiserman JCC is on the Main Line (45 Haverford Road; 610-896-7770). The Gershman Y is a cultural and arts mecca in Center City at 401 S. Broad Street (215-545-4400). It also houses the Philadelphia Jewish Sports Hall of Fame. The Jewish Renewal movement was partly founded by residents Zalman Schachter-Shalomi, Arthur Green and Arthur Waskow in the 1960s. The movement is still based in Philadelphia. National Museum of American Jewish History. Photo by M. Kennedy for Visit Philadelphia. Educational institutions range from the Reconstructionist Rabbinical College, founded in 1968, to the Jewish Farm School. The K-5 Perelman Jewish Day School sprawls across two campuses in Wynnewood and Melrose Park. The Mandell Educational Campus in Melrose Park houses Gratz College and the Jewish Community High School. The Barrack Hebrew Academy, originally the Akiba Hebrew Academy, is a pluralistic, coed Jewish day school. 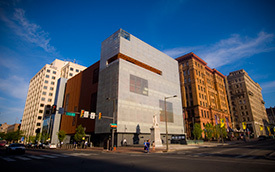 The Feinstein Center for American Jewish History, part of Temple University, sponsors lectures, exhibits and concerts (1114 W. Polett Walk; 215-204-9553). Theatre Ariel (www.theatreariel.org) has commissioned over 60 new works since 1990. The weekly Jewish Exponent was founded in 1887. Hadassah of Greater Philadelphia counts over 10,000 members in 20-plus groups (215-732-7100). From July 14 to 15, the Hadassah National Business Meeting & Symposium will be held at the Sheraton Philadelphia Society Hill. Philadelphia’s historic district is eminently walkable and combines Jewish and general sights. Start at Mikveh Israel, a squat red-brick building across the street from the Liberty Bell (44 N. Fourth Street; 215-922-5446; www.mikvehisrael.org). The congregation moved to Independence Mall during the Bicentennial, but transported furnishings from its previous buildings. In typical Sefardic style, the teba (bima) is in the middle of the sanctuary, with benches facing it; a low mehitza separates the women’s section. The wood-and-metal reader’s table dates from 1782; a modern replica of a Dutch Walloon chandelier hangs above it. Outside, a memorial to Yonatan Netanyahu, hero of the Entebbe raid and brother of Israeli Prime Minister Benjamin Netanyahu, recalls the family’s 10-year association with the synagogue and the community. Their father, Benzion, was a scholar of Spanish Jewry who taught at Dropsie college and was a Mikveh Israel member. The brothers attended Cheltenham High School. The National Museum of American Jewish History’s prominent presence overlooking the mall provides the opportunity to explore the story of American Jewish life through portraits, documents, artifacts, Judaica, hands-on galleries for children and interactive technology (101 S. Independence Mall East; 215-923-3811). The first Prayer for Our Country, written in 1798 to celebrate the ratification of the Constitution, was written in Hebrew—but the words president and vice president are inserted in English and an acrostic spells out Washington. A free first-floor installation, “Only in America,” features 18 prominent Jewish Americans including Henrietta Szold, Emma Lazarus and Barbra Streisand. 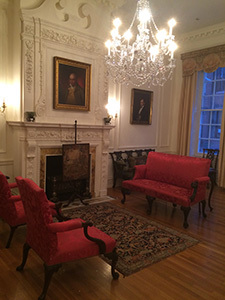 The parlor in the Rosenbach museum. Photo by Rahel Musleah. Build in extra time for a security check at the Liberty Bell, Independence Hall and other sights in Independence National Historical Park. Housed in a glass pavilion, the bell is close enough for visitors to view the famous crack that appeared on its first ringing, July 8, 1776, and to read the inscription from Leviticus, “Proclaim liberty throughout all the land unto all the inhabitants thereof.” Stop at the Visitors Center at Sixth and Market to purchase tickets in advance for the 40-minute tour of Independence Hall. Thomas Jefferson drafted the Declaration of Independence in rented second-floor rooms at Graff House, now restored and known as Declaration House (Seventh and Market). Simon and Hyman Gratz had a retail store downstairs. Elfreth’s Alley, the oldest continually inhabited street in the United States, was home to many colonial Jews. Fur trader Jacob I. Cohen lived at No. 124; he hired Daniel Boone to survey land on his behalf. Episcopal Christ Church has had a cordial relationship with Mikveh Israel since colonial times: The ministers of both congregations walked arm in arm during the parade for the ratification of the Constitution. Inside, a Hebrew plaque thanks Mikveh Israel’s members for their financial generosity when the church needed assistance. The church keeps a set of kosher dishes for the annual fellowship dinner between the two communities (Second Street above Market). The Rosenbach Museum and Library, two contiguous townhouses on tiny Delancey Place near Rittenhouse Square, features the vast collection of brothers A.S.W. and Philip Rosenbach, dealers of rare books and manuscripts and developers of renowned libraries. The parlor, a hub of Jewish history, holds portraits of the Gratz family, who were relatives, including two by Gilbert Stuart. Early Jewish books include 15th-century Pentateuchs and mahzorim. The former Jewish Quarter borders the historic district. Today it is a mix of funky and upscale. Gaskill Street was a mecca for artists, musicians, cafés and bathhouses. Fourth Street was Fabric Row and Randolph Street was filled with markets. Homemade Goodies by Roz (215-592-9616), a kosher bakery on Fifth Street, is one of the few remaining Jewish shops. Look across the street at the “S and B” atop the building that once housed Samuel Bogoslovsky’s Catering. B’nai Abraham. Photo by Rahel Musleah. A former maternity hospital at 532 Spruce Street still bears a sign that reads “The Rebecca Gratz Club.” Now condominiums, the hospital offered free two-week stays for Russian Jewish mothers-to-be. Of the original 45 synagogues in the quarter, only 4 remain. Call ahead to arrange visits. B’nai Abraham was the first to be built in the area (1910). An imposing yellow-brick structure with the Ten Commandments rising above a large rose window, it is led by Chabad today (527 Lombard Street; 215-238-2100; www.phillyshul.com). As Jews moved in, Christians left; many church buildings were purchased by synagogues. Society Hill Synagogue was a Baptist church erected in 1829 by notable architect Thomas Walter, who later designed the Capitol Dome in Washington; the Romanian community purchased the old church in 1910, but it fell into disrepair until it was acquired in 1967 by a Reconstructionist congregation and restored. The Yiddish words Der Groysa Romanishe Shul appear over its doorway (418 Spruce Street; 215-922-6590; www.societyhillsynagogue.org). 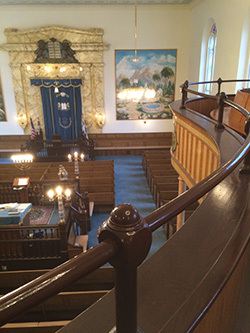 Kesher Israel was built as the Universalist Church in 1796 and converted into a synagogue in 1889. The first large Zionist meeting in the country met there in 1897. The congregation is egalitarian, but the women’s balcony still curves gracefully above the men’s benches. Two hand- painted murals depict scenes of ancient Israel (412 Lombard Street; 215-922-1776; www.historickesherisrael.org). Kesher Israel. Photo by Rahel Musleah. A drive up Broad Street and Old York Road traces the Jewish migration north. Reform congregation Rodeph Shalom’s massive Byzantine-Moorish structure was built in 1928 (its second home). Set against walls of painted and stenciled fabric, the Ark of bronze, brass and glass has motorized doors that weigh almost 1,000 pounds. In the foyer, the Obermeyer Collection displays more than 500 works of ritual art (615 N. Broad Street; 215-627-6747; www.rodephshalom.org). Conservative congregation Beth Sholom springs from the ground at 8231 Old York Road (215-887-1342; www.bethsholomcongregation.org). 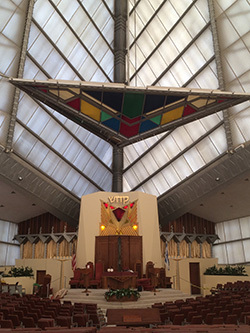 Visitors from 62 countries have viewed the “Temple of Light” Wright designed in affectionate collaboration with Rabbi Mortimer J. Cohen; it was completed a month after Wright’s death in 1959. The soaring ceiling made of plastic panels change with the light at different times of the day to highlight the feeling of a sunken desert amphitheater. The massive triangular stained-glass chandelier reflects the repeated geometric motifs throughout the sanctuary. A visitor’s center features a short film and interactive kiosks with original letters and architectural drawings by Wright. Stop at Keneseth Israel (Reform) next door to see its 10 vibrant stained-glass windows hand-blown in 3,000 colors that depict prophetic visions from Abraham to Isaiah. The Temple Judea museum (named for the synagogue Keneseth Israel merged with in 1982) displays the work of artist members and rotates items from its collection, which includes the second-oldest known American ketuba (8339 Old York Road; 215-887-8700; www.kenesethisrael.org). 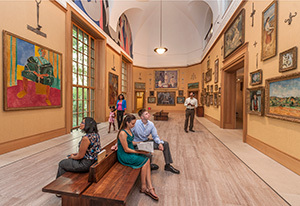 Philadelphia has a trove of world-class museums along the Benjamin Franklin Parkway (www.parkwaymuseumsdistrictphiladelphia.org). The Barnes Foundation. Image courtesy of Visit Philadelphia. The Barnes Museum features the collection of Albert Barnes, a physician and early supporter of many famous artists. The 3,000-plus works are arranged by line, light, color and space. There are works by Jewish artists Chaim Soutine, Amedeo Modigliani, Jacques Lipschitz, Camille Pissarro, Moïse Kisling and Marc Chagall (20th Street; 215-278-7000; www.barnesfoundation.org). The Philadelphia Museum of Art (2600 Benjamin Franklin Parkway; 215-763-8100; www.philamuseum.org)—its 72 stone steps made famous in the rousing final scene of the film Rocky—contains works by Jewish artists Pissarro, Modigliani, Chagall, Mark Rothko and Roy Lichtenstein. The Eastern State Penitentiary is a Gothic former prison founded in 1829 on the Quaker-inspired belief that solitary confinement could reform criminals. Inmates included Al Capone. The Alfred W. Fleisher Memorial Synagogue is tucked into a narrow alleyway off Cellblock 7. It was restored in 2008 and opened to the public (22nd Street and Fairmount Avenue; 215-236-3300; www.easternstate.org). Other sights range from the Martyr’s Monument to the Jewish Victims of the Holocaust (16th Street) to the Fels Planetarium of the Franklin Institute, endowed by Jewish soap manufacturer Samuel Fels (20th Street; 215-448-1200; www.fi.edu). Edward Rendell was the city’s first Jewish mayor and was later elected governor. United States Senator Arlen Specter got his start as the city’s district attorney. Philanthropist and publisher Walter Annenberg served as ambassador to the United Kingdom and owned the Philadelphia Inquirer. Comedian David Brenner, actor Jack Klugman and and Oscar-nominated filmmaker Sidney Lumet were Philly natives, as is television star Bob Saget. Literary stars with Philly associations include playwright Clifford Odets (Awake and Sing!) and author Chaim Potok (The Chosen). Singer Eddie Fisher and jazz artist Stan Getz contributed to the national music scene. Architect Louis Kahn and art collector and museum founder Solomon Guggenheim were prominent in the arts. Several titles by best-selling local author Jennifer Weiner are set in the city; In Her Shoes (Washington Square Press) was made into a film starring Cameron Diaz. Rich Boy (Twelve) by Sharon Pomerantz, winner of the National Book Award for Debut Fiction in 2010, tells the story of Robert Vishniak, an enterprising Jewish man who originally hails from the working-class neighborhood of Oxford Circle. Two good references are History Colonial Times to the Age of Jackson (Jewish Publication Society) by Edwin Wolf and Maxwell Whiteman and Jewish Quarter of Philadelphia: A History & Guide 1881-1930 (Jewish Walking Tours) by Harry D. Boonin. Plan your trip using Visitphilly.com. Simmi Hurwitz conducts individual and group tours for the American Jewish Committee (215-665-2300). Travel writer Oscar Israelowitz, author of Jewish Heritage Trail of Philadelphia, offers full-day group tours (www.israelowitzpublishing.com). Reading Terminal Market hosts over 80 merchants with cuisine from Asian and Middle Eastern to Pennsylvania Dutch and organic vegetarian (12th and Arch Streets; www.readingterminalmarket.org). Israeli-born chef Michael Solomonov’s Zahav (237 Saint James; www.zahavrestaurant.com) has brought Jerusalem’s culinary heritage to Society Hill, earning him rave reviews at the same time. Solomonov’s other eateries are Dizengoff (1625 Sansom Street; www.dizengoffphilly.com), East European restaurant Abe Fisher (1623 Sansom; www.abefisherphilly.com) and Federal Donuts (four locations; www.federaldonuts.com). None is kosher. Vegan restaurants Vedge (1221 Locust Street; vegphilly.com) and V Street (126 S. 19th Street; vstreetfood.com) are owned by chefs Rich Landau and Kate Jacoby. Kosher choices include Middle Eastern Hamifgash (811 Sansom Street; 215-925-3550) and Maoz (1115 Walnut Street; www.maozvegetarianphilly.com). Judah Mediterranean Grill in the Krewstown Shopping Center (www.judahgrill.com) and the dairy Espresso Café and Sushi Bar (7814 Castor Avenue; 215-745-0130) are in the Northeast. Citron and Rose focuses on local sustainable kosher dining in Merion Station (307 Montgomery Avenue; citronandrose.com). Come to the City of Brotherly Love hungry for history and culture and you will leave a Philly fanatic. Rahel Musleah’s website is rahelsjewishindia.com. The roof of Beth Sholom Synagogue is made of the original glass panels. As correctly stated in the article, the ceiling is made of plastic panels. Wow! I loved this article! Thanks so much!